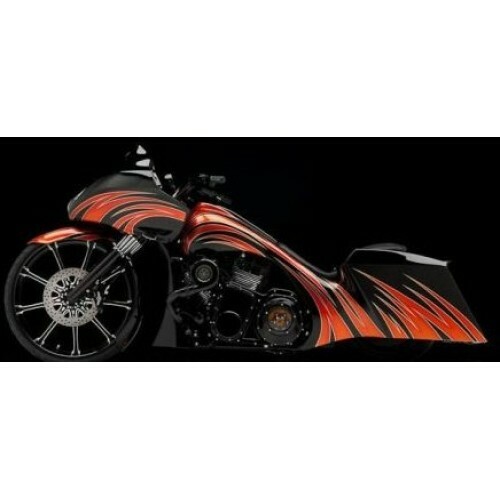 Our Painter has been painting Custom Bikes for over 14 years. He started out painting Motorcycles as his first love. It shows in his personal touch, design and color schemes. As a Custom Painter, he can produce Flames, Live Fire, Two Tones and many other designs. His Pinstripes are among the best we've seen! He does minor Air Brushing, especially "shadowing" to give the "Floating" effect of Flames and Graphics. Custom Paint jobs are Priced on a Per Job bases, so feel free to email us a GRcustoms@ymail.com for a quote!